5 types of voice over for a viral video! Siddhu - January 25, 2016 - Leave your thoughts. One of the most important but often overlooked factor in any video is the sound. This is to some extent acceptable in a film or any live action video. But animated explainer videos are a different story altogether. Animated explainer videos thrive on sound. Why? Because it is always the sound that explains and gives life to the video. The videos can only convey so much. So how is sound used in an animated video? Sound effects, BGM, the newly popular voice sounds, or the all important voice-over. But what is a voice-over? A Voice-over is no more and no less than the voice in and of an animated explainer video (or any other audio visual piece for that matter). However, voice over is not such an easy concept to grasp. There are video making companies with more than 500 videos using only 3 types of voice over and still going good. There are companies using 20 types of voice over and still fail. Voice over, therefore, depends upon the content. It should be used effectively and judiciously. Now let us see 5 types of voice over that will be apt to the content you’re talking about. Just imagine Morgan Freeman explaining your animated video. Close your eyes and just imagine. What will you do? Simple. Like any other sane person in the world, you’d just put the video on a loop. That’s right. 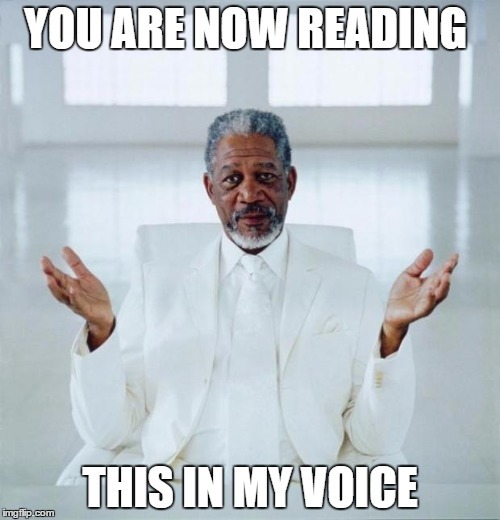 An authoritative voice like Morgan Freeman’s is not just powerful, but highly charismatic. It demands you to listen, to respect the video. That is what using an authoritative voice in your video does. It makes your video all of a sudden, highly respectful. And tell me how many videos are out there having an authoritative voice that is not generic. Zilch. Zero. Zip. Time to go viral. It is not always you can go for authoritative voices. Like mentioned before, the voice should match the content. You can’t show a teenage character and make him sound like Sylvester Stallone. That would be funny but in a bad way. What you can do is just the tune down the bass of the same Sylvester Stallone’s voice. Yup. that simple, imagine Sylvester Stallone’s voice in a childish tone. Not only that will be funny, but also it will apt for a teenage animated character. Take the following video for instance. Skip to 1:20 if you are in a hurry, (if not, then watch the entire video, it’s worth your time) here you can find a very silly and a funny voice of a child. Child? Are you sure. It’s the same voice of the narrator present in the video! Surprise! All that was done here is a little bit of tuning down the bass in his voice. And guess what? The voice fit perfectly for the robot and the video was a huge hit. So, let your imaginations run wild and tell me it if it doesn’t go viral. Genie from Disney’s Aladdin is one of the most memorable animated characters. The reason is the person behind the voice. Robin Williams' infectious energy while giving voice to Genie is so evident that it took the whole movie to another level. It was fast-paced, energetic, inconsistent and completely new. The current voice overs in animated explainer videos are mostly somber and boring with one tone and often horrifying BGM. How about you change the landscape by injecting some life to the voice overs. Viewers WILL be hooked and your video will be the next big thing in the industry. Experiment with the voice over. Take a look at the different voice tone and voice modulation of Robin Williams. Imagine doing something like that with your video. Think about it. Food for thought. One of the reasons why Apple is not doing astounding business as it used to do is because of the change in their brand voice. In a metaphorical sense. After the passing of Steve Jobs, the trust factor of Apple had slowly deteriorated. That’s the same with voice overs also. A trustworthy voice is not built overnight with a single video. It happens over a time, using a native voice actor is the unquestionable answer in order to make a trustworthy explainer video. Make your video native by speaking in regional language if necessary. Chinese people are not going to understand a video that has a voice over with a Norwegian accent. In fact they can’t even pronounce Norwegian properly and they don’t have to since it doesn’t matter to them. When you want to do business, talk to your customers in the language they understand and not the language you’re comfortable with. Take a look at this video to understand the importance of a native voice. The target audience of this video is very specific - Chinese people. The voice over therefore is in Mandarin. Simple. Most of us make the mistake of using voice over when it is not at all needed. As much as sound is important to your video, always remember that it is a video first. Moving images. If you are confident enough to explain your animated explainer video without the help of any voice over, then don’t use any voice over. In a world where voice overs have become common and is overused, sometimes the best type of voice over if you want to go viral is silence. I know that you really won't have time to go through this article in times of urgent perils. So I have made this small reference table to make your life easier.